Last night I went to see Cavalia in the Big White Tent in Bicentennial Park in downtown Miami. It was a beautiful show and the horses were stunning. The sets were like magical dreamscapes pulled out of fairytales. It was a long show but the time went quickly. It was my birthday celebration since tonight I'm working. I've taken a real job, yes a real job since writing hasn't been paying enough. I'm working as a night manager at the newly opened restaurant PROOF Ocean Drive (where the old Table 8 was located) in the Z Ocean Drive Hotel. The food is wonderful and it's a lovely restaurant. Come by and say hello. 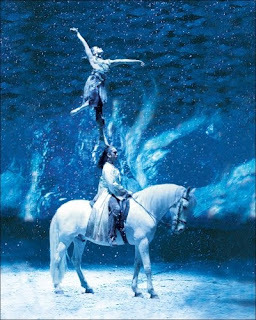 Photo from Cavalia.